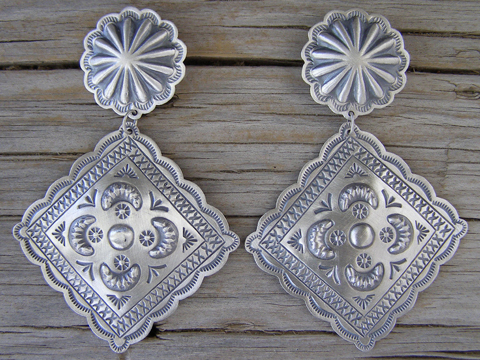 The posts are repoussée starred buttons and the free-swinging drops are diamond-shaped conchas. The stamping is busy and meticulous. These are large, but they are made from light gauge Sterling so they don't weigh too much. Classic! Hallmarked Harold J and stamped STERLING on the drops. Diamond concha drops: 2" x 2"